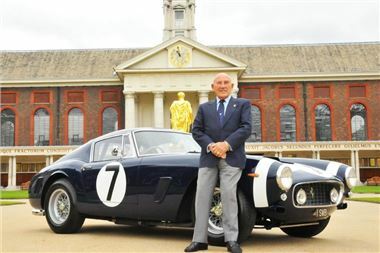 At the age of 81, Sir Stirling Moss OBE may have retired from competitive motor racing, but is still living life in the fast lane. And one of the motor racing legend’s first public appearances since hanging up his famous ‘Herbert Johnson’ (his white, open-faced crash helmet from the 1960s) will be as Patron of Chelsea AutoLegends. It’s a fitting link. Moss has lived in London all his working life while Chelsea AutoLegends has been described as London’s greatest show on wheels. It will be held at the Royal Hospital Chelsea on Sunday 4 September. “London is the centre of the world, a place with a real pulse. It is entirely fitting that somewhere as great as our capital has a show as dynamic as Chelsea AutoLegends,” said the 16-time Grand Prix winner. Sir Stirling’s top flight motor racing career ended in a high speed accident at the Goodwood circuit in 1962, but a more recent career in historic motor sport ended in less dramatic circumstances, this June. Halfway through qualifying his Porsche RS61 for the Le Mans Legends event, he suddenly realised it was time to call it quits. He drove back to the pits, got out of the car and announced his retirement. “I scared myself and I always said that, if I felt I was not up to it or that I was getting in the way of fellow competitors, then I would retire.". While he might no longer be driving in anger, Moss still plans to be involved in historic motorsport events, giving demonstrations runs or, as at Chelsea AutoLegends, being involved as a figurehead. “I went to the first AutoLegends show last year and loved it. There were so many fabulous cars and familiar faces there, that I was delighted when they asked me to be Patron this year. Among the many iconic cars on display will be the very Ferrari 250GT SWB that Moss drove to victory in the 1961 Tourist Trophy at Goodwood. It was entered in the race by another motor racing legend, the late Rob Walker. Walker, Colonel Ronnie Hoare, Tommy Sopwith and John Coombs were all superb examples of team ‘Patrons’ – private entrants who took on, and often beat, the works teams in the 1950s and 1960s. All four will be honoured at Chelsea AutoLegends with an invitation only dinner the evening before the event, with special displays of some of the most important cars linked to the teams. For Moss – a special guest at the dinner – memories will be stirred not just by the TT-winning Ferrari, but also by the 1959 Cooper Climax T51 in which he won the Portuguese and Italian Grands Prix in that year. Other special themes at the show will include displays of Le Mans cars over the years, Group B rally cars and classic bikes. There will be cavalcades of supercars and motorcycles arriving at the show during the day, plus special tributes to the Jaguar E-type and Mini Cooper – both 50-years-old this year. The ten most significant road cars of all times, as voted by Autocar magazine, will be on official display with countless other classics in the car parks. It’s not just cars but people, too. As well as Sir Stirling, multiple two-wheel World Champion Phil Read and rally hero Russell Brookes will also visit. And in keeping with the venue which is just a stone’s throw from the Kings Road, and the many displays from the Swinging Sixties, it is hoped that visitors will get into the spirit of the day by wearing mini skirts, kaftans and bell-bottoms and put flowers in their hair. Tickets for this year’s Chelsea AutoLegends are now on sale either via the event’s website (www.ChelseaAutoLegends.com). Advanced adult tickets are £17 (£20 on the gate) and £10 (£20 on the gate) for 12-16 year-olds. Underlining the event’s family entertainment values, accompanied children aged under 12 will be admitted free of charge.